(From Tamron lens literature) Tamron now offers a lightweight, compact, high-image-quality telephoto zoom lens with macro capability of 1:2 that can be used with digital cameras. This new lens is a Di type lens using an optical system with improved multi-coating designed to function with digital SLR cameras as well as film cameras. Note: On January 21, 2008, Tamron announced a Nikon version (part number A17NII) will be available with built-in motor for AF compatibility with all Nikon DSLRs including D40 and D40x. A telephoto zoom is often the first lens amateur photographers add to their kit after purchasing an SLR. The ability to reach out and bring distant subjects up close is immensely appealing, and essential for many subjects. The 70-300mm focal length range was a traditional one in the film days, covering a range from relatively short to fairly long focal lengths. In the digital world (with its smaller sensor sizes), this lens roughly translates to a 105-450mm zoom, pretty long by any standard. The Tamron 70-300mm f/4-5.6 Di LD Macro 1:2 AF is very appealingly priced for novice users, and throws in surprising macro capability as a bonus. But how did it handle our battery of tests? Read on for all the results! Chromatic aberration is quite reasonable from 70-180mm, and very good in the vicinity of 100mm. As with blur though, chromatic aberration becomes quite pronounced at 300mm, particularly in the corners of the frame. Here we can see one benefit of using a lens with a 35mm image circle on a digital SLR with a sub-frame sensor: Light falloff in the corners of the frame is very low by any measure, and absolutely excellent one stop down from maximum aperture. As with shading, so went distortion: The Tamron 70-300mm f/4-5.6 showed relatively slight pincushion distortion across most of its zoom range, switching to very slight barrel distortion at 70mm. AF speed is one area where the Tamron 70-300mm's bargain construction shows: It's downright leisurely, particularly as the focus point is approached, where it seemed to "gear down" on our 5D body. That said though, it almost always went right to the proper focus setting, only rarely "hunting" back and forth. This lens wouldn't be a first choice for situations requiring high focusing speed. That is, it might do fine for a sport like baseball, where the action frequently happens at certain well-defined locations (the bases), but would likely struggle with a sport with wide-ranging action like soccer or football. Manual focus adjustment is pretty smooth, with a decent range of travel that makes it easy to home in on the precise focus point you need. The focus ring moves so easily though, that it's easily jostled from its setting by a casual touch. The macro setting on this lens is restricted to use between 180 and 300mm, unfortunately the range where the lens is at its softest. Note that the macro/normal switch, focusing ring, and zoom collar are all interlocked, so you have to have the zoom set to between 180 and 300mm before you can switch into macro, and you won't be able to switch back out again until you move the focus ring outside the macro range. (This could cause some confusion if you weren't expecting it, a case where reading the manual (or this review) might be helpful. At 300mm, the minimum working distance is just over three feet (just under one meter), a pretty long working distance that can either be a benefit or limitation, depending on the subject you happen to be photographing. At that distance, it takes in a subject area a bit under three inches wide on a full-frame camera, correspondingly less on a sub-frame model. For an inexpensive lens, the Tamron 70-300mm f/4-5.6 felt surprisingly solid and operated quite smoothly. As noted above, we'd actually like just a little more resistance in the focus ring, but the zoom ring worked very smoothly, and with just the right amount of resistance: It was stiffer than many zooms in this respect, but the upside is that it showed virtually no tendency toward "zoom creep" when the camera was held with the lens pointing straight up or down. Overall, the Tamron 70-300mm f/4-5.6 felt better than we'd normally expect from a lens with such a low street price, a pleasant surprise in the handling department. As of this writing (early February, 2007), we haven't tested any lenses in this focal length range from the camera manufacturers, nor any competing models in the same price bracket from other third-party manufacturers. The lenses most Canon or Nikon DSLR owners will probably consider against this Tamron model are the 55-200mm lenses from the respective camera makers. Priced slightly higher than the Tamron 70-300mm the Canon EF 55-200mm f/4.5-5.6 II USM is also a full-frame lens, although we only tested it on a sub-frame body. (It was one of the first lenses we tested, before we began using the EOS-5D for full-frame tests.) It's actually quite close to the Tamron unit's performance in many areas, although the Tamron is a fair bit sharper, even at 300mm than the Canon is at 200mm. Chromatic aberration is roughly similar on both lenses, although the Canon does noticeably better in the middle of its focal length range. Distortion and shading are quite similar between the two optics, so the Tamron probably gets the overall nod for its combination of lower price, longer focal length range, and somewhat better sharpness from 180-300mm. In the Nikon camp, the Nikkor 55-200mm f/4-5.6G ED AF-S DX is a reduced image-circle lens build specifically for digital SLRs with sub-frame sensors. It's moderately sharper than the Tamron across its focal length range, and has lower chromatic aberration at large apertures, but similar CA when you stop down. Distortion and shading are both quite a bit higher than in the Tamron model though, so the Tamron again probably gets the nod, although the better sharpness of the Nikon lens is appealing. While there are a few standout bargains to be found, the lens world is much like the rest of life: There's no free lunch, you tend to get what you pay for. It's thus no surprise that lenses as inexpensive as the Tamron 70-300mm f/4-5.6 don't perform as well a those costing three or four times as much. Within its price bracket though, this Tamron competes quite strongly against the camera makers' own offerings, delivering as good or better image quality, a long zoom range, decent build quality, all at an exceptional price. If you need a long zoom on a tight budget, the Tamron 70-300mm f/4-5.6 Di LD Macro 1:2 AF is worth a close look. The larger pixels of our full-frame Canon EOS-5D test bed make for somewhat better blur performance. We were surprised by how well the lens did in the corners of the frame, where we often see increased softness at the edges of a lens' image circle. A surprisingly good performance, as long as your camera's pixels are large enough. Chromatic aberration was also somewhat better on the 5D, although it did get a little high at maximum telephoto. While the Tamron 70-300mm's blur characteristics held up quite well on the 5D's larger sensor, shading was another matter. There was a full 1/2 stop of light falloff in the corners at all focal lengths, decreasing as the aperture was stopped down. One stop down cut the falloff about in half, two stops brought it down to a pretty low level. There's once again very slight barrel distortion at 70mm, but that quickly changes to rather pronounced pincushion distortion as you zoom. You may not notice this much on landscape or nature shots containing few straight lines, but shots of buildings or other man-made objects will show pronounced curvature where straight edges run parallel to the edges of the frame. While the larger pixels on our full-frame EOS-5D test bed helped some aspects of this lens' performance, its distortion and vignetting become quite high when you ask it to cover the full 35mm frame. Stopped down, it might do in a pinch, but if you've invested in a full-frame camera, you should probably make the extra investment in quality glass to get the most from it. Auto Focus noisy and sluggish. This is a full frame lens and I'm using it on a crop sensor body. I am very pleased with the image quality. Real life isn't tack sharp why should the images we capture be any different? The softness this lens reputedly suffers from is nothing that correctly used software can't sharpen and maybe it's just me but I like the realism the lens captures. One bugbear. Autofocus is incredibly noisy and annoying sluggish. This problem is easily eliminated by switching the lens to Manual and using it the old fashioned way. I bought it for $129 used. Nothing can go wrong for the price. This lens is surprisingly sharp, and it does well in Macro (1:2) too. Handling is good, feels comfort and easy to grip. It also has that solid feel in your hand (doesn't feel cheap). It comes with a nice hood. The minus side is the focusing mechanism. It has slow focusing (esp. in Macro mode). I prefer using manual override for macro. Sometimes it hunts too much when used in lowlight situation. Overall, it's a great telezoom for travelling. It's lightweight, sharp & does Macro too. Nice! I bought this lens about 18 months ago for use on my Nikon D80. Mine is the built in motor version, which focusses a bit slowly, but accurately. I was immediately impressed with its usefulness as a nature photography lens, being able to photograph birds in flight or at rest, or switch to macro and take excellent photos of insects, small animals, flowers, etc. Being able to then switch to the macro capability is very useful in the field, with the long working distance at the maximum magnification of 1:2 being ideal for photographing nervous insects etc. The Nikon 70 - 300 VR lense I bought subsequently does a better job of photographing birds (at a much higher cost). I also bought a Nikon 105 VR Micro lense which, while excellent, does not provide the same working distance as the Tamron lense. The 2 Nikon lenses are also much heavier, more expensive and slower to swap over in the field. The Tamron lense on the other hand can be converted from zoom telephoto to zoom macro quickly (see below!) before your subject leaves. Cons: On the negative side, I would say that images taken with the Tamron lense do not have the richness of colour of the Nikon lenses, however this can be adjusted in post processing to the user's taste. Also, the process for engaging and disengaging the macro function is fiddly and needs some practice to be used comfortably. Conclusion: Overall, an excellent lense for the beginning photographer on a budget. Despite its quite big, the weight is low. It feels like hollow plastic. Metal mount is positive. I bought this much because of the 200-300mm range, but this range disappoints me. Its quite soft and have bothersome CA in this range. At 70-200 its quite good for its price. Always stop it down one aperture for best results. Auto focus is very slow and hunts for focus a lot in the 200-300mm range. Sometimes it just get stuck at the wrong end of the focus range. I often end up switching to manual focus to get the job done. Macro mode has quite good image quality but it might be difficult to hand hold the camera steady about 1 meter away. Use manual focus in macro mode. Reversing the hood from storage position to shooting position can be difficult because it rotates the focus ring and front element. Spend a little more and get something better. Even if the alternative doesn't go all the way to 300mm. and i am still shooting with it. color fringing better (the Sigma APO one). so far I find the macro quite handy... you just need to be conscious on how to switch to macro mode and back..
it delivers sharp images at 70mm to 100mm yet it is soft beyond 180mm..
Was fortunate enough to pick this up as a package with Tamron 17-55 f/2.8, so effectively did not pay that much, but even for the average retail price I would say its decent value. I wasn't really expecting to use it that much, just thought it'd be a bit of a bonus with the 17-55 (which is excellent), but I do use it quite a bit and mostly happy with results. Sharpness and contrast seem to drop off at longer focal length (as most already note). I like the "macro" mode, if its a gimiick, its a useful one--although pity it can't kick in a bit earlier than 180mm. For me, I'm happy to use a tripod for close-up stuff, and unlike others, I have no trouble with the switch. I've had some decend results here with static subjects, and even the odd insect in flight (with lots of light). Pretty leisurely focus speed: you can attempt some action shots with it, but be prepared for (very) low hit rate. If you've got sufficient light, and its laterally moving, you're be better of in manual focus for this type of thing. For the price, hard to go that wrong. A very usefull lens, sharp between 70 and 260mm but don't forget stopping down while you increase your focal lengh (ex. 70mm sharp at f/5.6 / 135mm sharp at f/7.1 / 200mm sharp at f/11 etc...) to get the maximum out of it ! 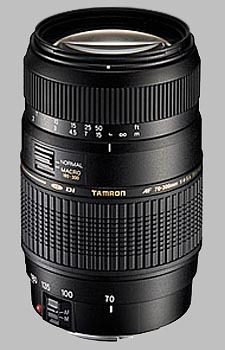 Of course now that Tamron has got its flagship lens (70-200mm f/2.8) it looks a bit cheap but it is 4 times cheaper too. I bought it with my Pentax K10D kit lens 18-55mm and after one year of practice I still love it. - MF ring a bit loose, especially for shooting macro. - loss of sharpness at the long end of zoom. - its extention is a bit exagerated. - Sharp in most of its range. - CA's well handelled same for distorsion. Chromatic aberration is noticeable at the longer focal lengths and in the corners, but is no issue at shorter focal lengths and in the center. The big problem of my copy is strong purple fringing at high contrast edges. Just one other reviewer noted this in this forum, so I assume that this could be a specific problem of my copy. I did not notice any distortion, vignetting or flare that is worth mentioning. Build-quality is acceptable for amateur-use. Focusing is slow at times but always accurate and I noticed occasional hunting at low-light. Overall the lens is usable through its entire focal length, when you keep a few large aperture values in mind that you might want to avoid because of noticeable corner blur. The purple fringing can be quite disturbing in high-contrast photos and it cost quite an effort to alleviate the effect in Photoshop. However, what makes this lens still very attractive is its low weight and relatively small dimensions, making it a good choice for travellers. Given the very low price of this lens, the image quality is actually quite acceptable. After reading much reviews i found out that this lens can be veery sharp if you use it the right way and produces very good images. Mostly i use it at f8 and 70-150 where it is at its best. 1:2 macro, zoom range, light, good handling, delivers very sharp images, best value for money!! It is my first lens beside the 18-55 kit lens. I got this as a gift since the original owner discovered that it wouldn't autofocus on his D40x. There's some severe chromatic aberration of the purple kind and blurring near its longest focal length, especially at its max aperture. Focusing speed is about on par with other non-AF-S lenses. The macro function is just a gimmick IMO, you need lots of light and a tripod for it to be effective. I suspect better samples of this lens exist since not every online review I've read about it notes the issues with blurring and chromatic aberration. When the sun is anywhere in or near the shot I've noticed that flare is really bad also. That's kind of expected for anything below $200. It's still good enough for my casual use anyway. Very good image quality for an inexpensive lens, better than the Nikon and Canon equivalents. Well worth using. Build quality better than you have a right to expect at this price point and image quality is pretty decent. was actually looking for something in the 200mm range and decided that for under $200 I would give this lens a try (not much to loose if I didn't like it). As I just recently purchased this lens I haven done much serious work with it yet but I am quite satisfied with the test shots I've taken espically if I stay below 200mm. Even the test shots I took at 300mm (on a bright clear day) weren't all that bad. For it's macro feature, once you get it into it's macro mode it does take some nice shots (note: a tripod is a must for macro shots at these focal lengths). Then the challange is getting the lens out of macro mode, luckly I was home because I had to go find teh bloody book to figure out how to exit the macro mode. Bottom line, if you're looking for a lens with a working range of 70-200 with the ocasional foray above 200mm this lens is a good value. I bought this lens as a starter all purpose zoom, i must say so far its not a bad lens, very light so its great to travel with, sometimes images can be not as sharp as i would like, better sharpness through the middle fstops. Big con is the macro switch, i have to take the lens of the camera to swith it back from macro to normal as it wont with it on the camera body.